Do you know the historical facts? After the battle, many Nanking citizens welcomed the Japanese military. The Japanese Army tried to respect the international humanitarian law. The population of Nanking was 200,000. However, China claims Japanese killed 300,000. This is The Truth of Comfort Women Issues! The criminals were not Japanese soldiers. This is A KOREAN PROBLEM. Comfort Women were kidnapped by Japan? Korean people should look at the fact straightly. 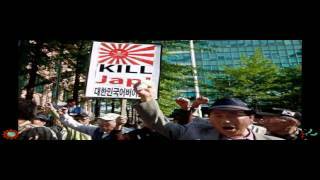 Korea should pay compensation to Japan! Koreans accusations are completely incorrect for these reasons. (EN)While I was trying to open this home page, my Japanese friends helped me open my pages on internet. In my country, it is very difficult to open it because there are many restrictions one way or another on using any provider company. Opening homepages takes a long time because I have to get an ID pass from the provider company and study the procedure of uploading my files to provider. I have no skills about that. However, I was helped by some Japanese friends so I am deeply grateful to them. Moreover, these historical topics are including many difficult words. Some words, Japanese, English and Chinese historical and difficult words give me a headache. Many of my acquaintance and friends who are from many countries have helped me to translate them. I want to say special thanks for their help. In my HP, there it does not show my mail address because of security. However, if I have a chance to help you in anyway, or if you can help me voluntary, please contact me at my Youtube mail （UndertakerRach04）address. When you have a great essay which is related to these topics, please sent it to me if you want. I will fell great pleasure with that. I hope the essay is consisted of Japanese and English. I want to make more useful and convenient HP for you. Thank you very much. Do you want to make a home page? Copyright (C) SimpleTmpl011 All Rights Reserved.